This year it felt like I blinked and summer was suddenly over. Today I'm looking out my window and the trees are sparse and orange and when I step outside of a morning, my breath is a chill cloud. 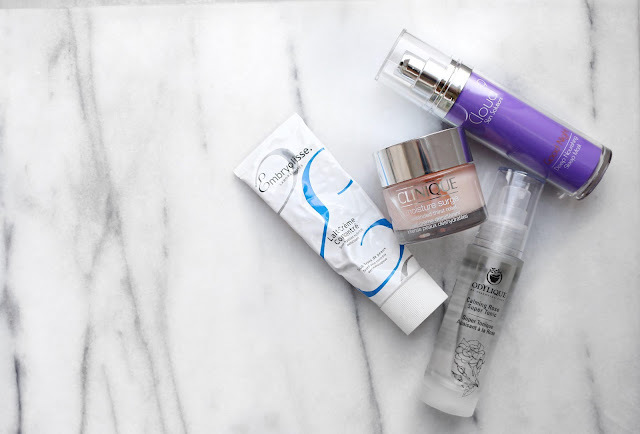 We all know when it's time to switch up our wardrobe for the colder months, but what about our skincare routines? My skin has been a lot drier, blemish prone and dull since the weather turned, and I'm sure I'm not the only one. Autumn skin is different so requires different care and these are the products I dust off when the temperature drops. Overnight treatments are amazing at the best of times, but especially when it's colder in the evenings... Simply apply, snooze and wash your face as usual in the morning - it really doesn't get more effortless than that. I've found myself reaching for the Cloud 9 Deep Nourishing Sleep Mask so much recently as it gives my skin the moisture fix it's craving. The mask contains avocado oil which provides intense hydration and also helps slow down signs of ageing. Lush! When I need a bit of heavy duty hydration, this is my go-to. Despite being so creamy and thick in texture, this doesn't make me appear over oily at all and instead gives me the radiant, healthy glow which I covet. This is also just the right texture to act as a moisturiser and primer, so I cut out the middle man between my skincare and makeup when I use this product. I would also especially recommend this moisturiser for sensitive skin, it's ingredients are designed to be extra gentle and loving. Issa French pharmacy thing, they have sensitive skin covered. Who doesn't love a face spritz? The only thing better than a refreshing, rehydrating spray, is one that contains insanely skin loving ingredients. Calming rose essential oil is the leading lady in this toning spray, which is amazing for nourishing and soothing skin and this spritz also claims to be particularly good for rosacea sufferers. Simply apply this before moisturising to instantly balance and hydrate your complexion. You can also use this throughout the day as a cooling, hydration top up. I adore this moisturiser for making my skin look youthful and plump in a flash. I find this great for every day use as it is comfortable, majorly hydrating but also not too heavy for my oily skin. If you want even more of a hydration hit, apply for 5-10 minutes as a mask. I also love that not only is this great for nourishing dry skin, but this product protects against pollution and other environmental aggressors, which is ideal for me working in London.